We provide compliance and repair services to meet the needs of any underground storage tank owner. Fortune 500 companies and data centers have the peace of mind of knowing their service provider is bonded and their service technicians are broadly experienced and can solve problems in realtime. Unlike our competitors, our technicians are expert in PLC controllers of any make as applied to our specialized industry. In similar fashion, their expertise is not just limited to a single brand of leak detection system. ICC Certified UST Technicians help Owners ensure UST monitoring system compliance with the law. Our Technicians are certified by Veeder Root and Franklin Fueling and have long-standing relationships with most CUPA. Older UST systems require SB 989 testing every 3 years. Our experienced technicians can help customers comply with this requirement – on-time and on-budget. California Title 23 requires UST Owners to have a licensed UST Operator for each UST System. We perform this service for several multiple tank Owners and can provide a competitive quote for your system. Fuel Oil Systems can diagnose and repair UST systems. Our experienced technicians can perform a consult free of charge with a phone call or email request. We offer cost competitive and timely fuel polishing and cleaning service. Our special 60 gpm unit means that Owners can receive time and cost efficient fuel cleaning on even the largest tanks. We sample the fuel before and after to assure value added cleaning. We performed 4 very large cleaning services in the last year. 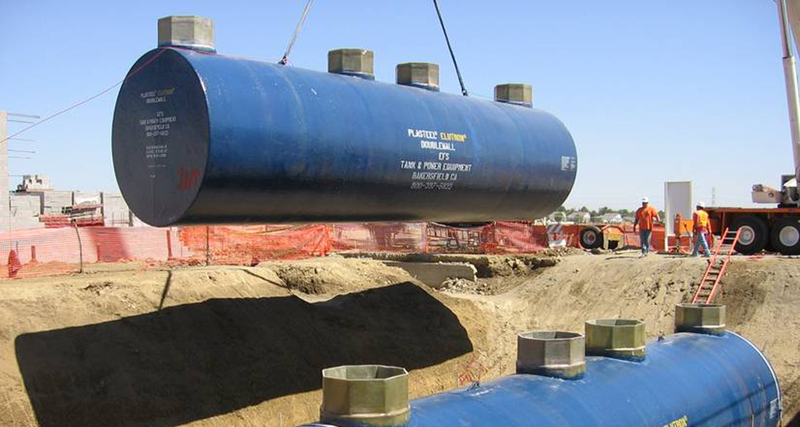 As both Design-Build and Plan and Specification installing contractors, we install Underground storage tanks, both large and small. We are expert in building highly reliable mission critical fuel systems. Our experienced Fiberglass technicians can perform repairs and installations of fiberglass sumps, risers and boots. We have performed many tank removals as well as product piping abatements and removals. Building owners and contractors can benefit from our experienced removal crew. As we often perform this work for mission critical clients, we are intimate with writing detailed Methods of Procedure so that work may be performed within an operating facility or operating data center environment.